Maximum size: 3.5 mm shell length. Identification: The shell of this species is more strongly inflated and thicker than comparably sized shells of Atys kuhnsi with a stronger columellar fold. Unlike shells of Atys(?) semistriatus, it is widest at its mid-point. 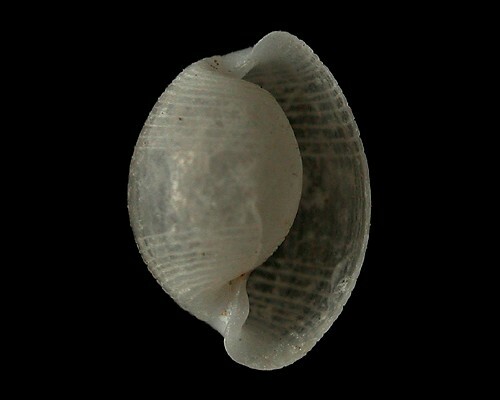 Natural history: The one known shell of Atys sp. #5 came from beach drift near a moderately exposed accretion platform inshore of a silty Halimeda kanaloana bed. Nothing is known about the living animal. Taxonomic notes: This shell seems sufficiently different from other listed species to suggest the presence of an additional Atys sp. in Hawaii. However, there's a chance that it may ultimately prove to be in a different genus. It was first recorded in Hawaii by CP from a sand sample collected from Maalaea Bay, Maui in fall, 1987. Photo: CP: 3.5 mm: beach drift; Maalaea Bay, Maui; fall, 1987.